A look at the most unlikely performance cars you'd ever imagine - the Japanese Kei class turbo guns! They're the smallest mass-produced cars in the world and they have engine capacities around half a litre. So you reckon we're talking about a boring commuter box with wheels? Guess again! Japan's Kei class performance cars are some of the most enjoyable to drive surprise packets on the road. That's right; park your big block in the shed and get started upsetting the establishment in a sub 1.0-litre ball of f-u-n! For those unaware, Kei cars are vehicles that meet certain body dimensions, engine capacity and power regulations set by the Japanese government. In addition to costing bugger-all to run, the Kei classers make a lot of sense given the lack of parking spaces in many areas of Japan, and - furthermore - they attract very worthwhile registration sweeteners. 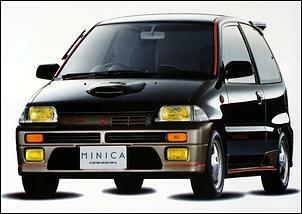 The first group of Kei cars were limited to 360cc engines (including 2-strokes! ), but this later grew to 4-stroke 550cc motors (with a maximum of 42ps or 31kW) and then - as you'll see - 660cc motors (with up to 64ps or 47kW). 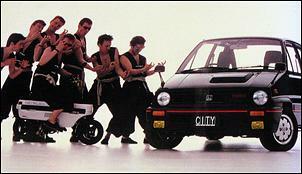 Prior to the introduction of the Kei class performance cars, it was Honda in 1982 that offered the nearest thing - the Honda City Turbo. Powered by an ER-series SOHC, 1.3-litre four-cylinder - with just a 7.5:1 compression ratio - the 'bulldog' look Honda pumped out a creditable 74kW at 5500 rpm along with 147Nm of torque at 3000 rpm. No question, the little Honda scooted its 690-kilogram kerb mass quite capably. Although still considerably larger than a Kei class vehicle, it was Nissan that took small car performance to the next level of performance and sophistication in the early '80s. Its Garrett turbocharged E15ET engine - displacing 1.5-litres - used a 8.0:1 compression and pumped out an impressive 85kW at 5600 rpm and 167Nm at 3200 rpm. Note that Nissan used the same E15ET engine in a number of vehicles from late '83 - the 1500 SSS Liberta, Laurel Spirit, Sunny, Langley and, of course, the Pulsar and EXA models as seen in Australia. Daihatsu, meanwhile, was heading further in the direction of what would eventually be the Kei high performance class. Its 1983 released G11 Charade turbo used a three-cylinder engine of just 993cc and - equipped with an IHI turbo blowing through a carburettor - it was rated at 59kW at 5500 rpm and 118Nm at 3500. 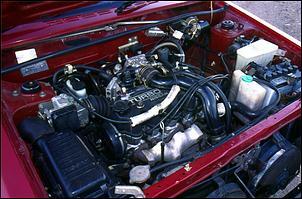 Like the Honda and Nissan, the Charade turbo ran without any form of intercooling. The turbo Charade was released as both a 4-door hatch (as delivered to Australia) and a 2-door hatch, with kerb weights of just 685 to 720 kilograms. A DeTomaso version - with the same output - was released in latter years. 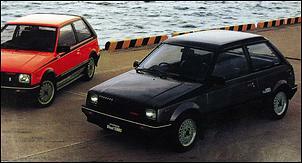 In late 1983, it appears that Daihatsu's Mira turbo debuted as the first hot Kei class ever. Using just a carby fed two-cylinder chugger displacing 550cc, the tiny terror employed a 8.2:1 static compression ratio and 'punched out' the maximum allowable 31kW at 6000 rpm with 56Nm at just 2500 rpm. The car itself, though, was very humble - the L55-series chassis (recognised as the first model Handivan in Australia) rode on a beam rear axle, 10-inch steel wheels and was only ever intended as a delivery vehicle... Oddly enough, a jacked up 4WD turbo version of the L55 Mira turbo - with slightly less power but greater torque - was released the following year; go figure! 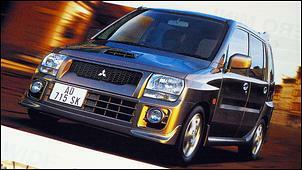 MMC - Mitsubishi Motors Corporation - was next on the bandwagon with its hot Minica. Available only as a two-door, the Minica used a G23B SOHC carburetted 546cc three-pot with a 8.5:1 compression ratio, good for 30kW and 57Nm at 6000 and 3500 rpm respectively. The weight of the Minica? Just 560 kilograms! Subaru and Suzuki were the next manufacturers to recognise the demand for pint-size cars with squirt. In 1984, Subaru brought out the 2-door Rex turbo hatch (similar to the Sherpa in Australia); using an EK23 SOHC 544cc three-cylinder motor, the IHI turbocharged Rex (not to be confused with WRX!) put out slightly shy of the maximum Kei class power output; 30kW at 6000 rpm and 58Nm at 3500 rpm. 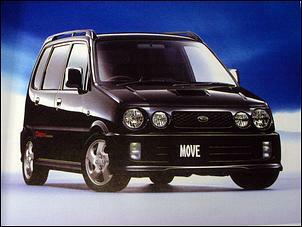 Like the Daihatsu Mira, a 4WD version was also released but added around 85 kilograms to the kerb mass. Suzuki, meanwhile, challenged with its new Cervo turbo - another 2-door only hatchback. Using a SOHC F5A 543cc three, the little Suzuki spat out a mild 29kW at 6000 and 54Nm at 4000 rpm. Interestingly, the same engine was mounted longitudinally in the Suzuki Jimny (aka Sierra) off-road 4WD. In late 1985, Nissan edged closer to the Kei category with its March turbo, which was a slightly larger 710kg 2-door hatch. The March's MA10ET engine used a 8.0:1 compression ratio to generate 63kW at 6000 rpm and 118Nm at 4400 rpm. In many ways, it was simply a downscaled Pulsar ET; still not quite Kei material, though. Daihatsu responded to its growing competition in late 1985 with an all-new version of the Mira/Cuore (known in Australia as the L70 Handivan). Boasting a much more up-to-date design with IRS, the turbocharged Mira TRX-X - apparently only available as a 2-door hatch - ditched the rough ol' 2-cylinder engine to make way for a new EB 547cc three cylinder with an IHI turbocharger. Output went beyond anything seen in its class, with 38kW (woo-hoo) at 6500 rpm and 70Nm at 4000 rpm. Weight, meanwhile, was kept down to around 570 - 590 kilograms depending if you bought a 2 or 4-door hatch version. Its no surprise the powerful new Mira became the top performer in the little league. The power war was surely on by this stage. 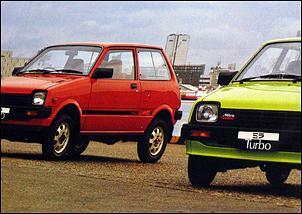 It wasn't long before Suzuki churned out its first Alto RS. With a F5A SOHC 550cc motor ticking under the bonnet, the Alto RS put out a substantial 35kW at 6000 rpm, but with a relatively modest 64Nm at 4000 rpm. The RS was a front-wheel-drive 2-door weighing just 580 kilograms, while a 4WD version - the Alto SX - added a further 60 kay-gees. The EB 547cc motor in the Mira TRX-X from late '88 got bumped up to a class-leading 43kW at 6500 rpm and a very sunny 73Nm at 4000 rpm. Weight was still kept down to under 600kg in both the front and optional four-wheel-drive models. 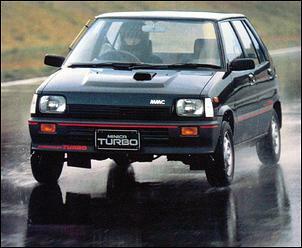 Also at this time, Daihatsu replaced the G11 Charade turbo - with its SOHC carby turbo motor -with the larger G100 Charade GTX-X boasting an awesome DOHC, 12-valve, EFI, 993cc three-pot putting out an incredible 77kW at 6500 rpm and 130Nm of torque at 3500 rpm. It's no wonder this little slogger went on to considerable rally success. For 1988, Japan's Kei class formula was revised to allow slightly larger vehicles but, more importantly, engine capacities were allowed to swell to 660cc and the maximum power output was lifted to 64ps (47kW) - an overnight 52 percent increase in grunt! The new era of Kei performance kicked off with vehicles such as the revised L200 Daihatsu Mira Turbo. Sporting a new EF-JL 659cc three-cylinder with a SOHC, 12-valve head, EFI and a small top-mount air-to-air intercooler, the revised monster Mira made the regulation 47kW at a high 7500 rpm plus 92Nm at 4000 rpm. The new Mira was available in both 2 and 4-door hatchback form and came with optional 4WD and 4WS. Subaru's Rex underwent a dramatic change with the new regulations. Oddly, it ignored any allowable increase in capacity and, instead, exchanged its turbocharger for a little positive displacement supercharger fitted to a new EN05 SOHC 547cc mill running EFI, an intercooler and a 8.5:1 compression ratio. Output was 45kW at 6400 rpm and 75Nm of torque at 4400 rpm. All-wheel-drive was, of course, available to buyers. 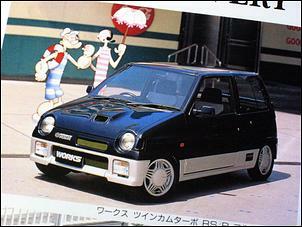 One of the trickest of all Kei class turbocars appeared during 1989 - the Suzuki Alto Works RS/R. Undeniably eye catching with its round headlights and tough body kit, the all-wheel-drive RS/R used a F5B 547cc, DOHC, EFI, air-to-air intercooled engine pumping out 47kW at 7500 and 77Nm at 4000 rpm. 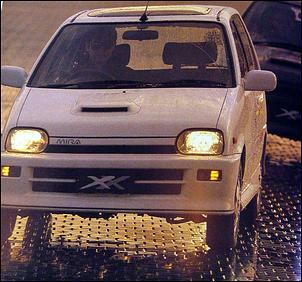 Note that a front-wheel-drive version of the Alto turbo - the Works S/X - was also available with slightly detuned form. For 1991, the Alto Works' engine was swapped to something a little more serious - a 658cc F6A DOHC design, which allowed the 47kW max output to be attained at lower revs - 6500 - as well as a strong 90Nm of torque at 4000 rpm. 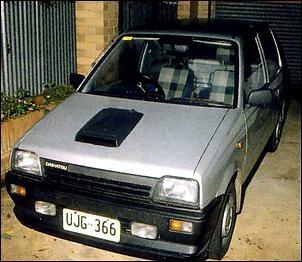 The 'non Works' turbo version of the Alto, meanwhile, used a slightly less grunty 657cc DOHC F6B engine. In 1989, the new MMC Minica Dangan ZZ4 - arguably one of the hottest Kei classers to this day - hit the scene making the most of the new regs. With its striking looks (and a triple outlet exhaust tip! ), the Dangan ZZ4 sported a 3B83, DOHC, 15-valve, three-cylinder with an intercooled turbo giving the regulation 47kW of thrust at 7000 rpm. Peak torque was a class leading 94Nm at 3500 rpm, ensuring the all-wheel-drive ZZ4 - which weighed just 720 kilograms - was no slouch. In later models, torque was also upped to 96Nm at the same 3500 rpm. A new 'bubble' Minica hit the streets in 1993 employing a new generation 4A30 659cc, DOHC turbo intercooled motor cranking out, of course, 47kW at 7000 rpm and a mammoth 97Nm at 3500 rpm. Weight though, had crept up to 780 kilograms. 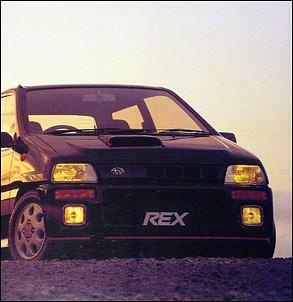 For 1990, Subaru upgraded its Rex turbo hatch from disadvantaged 547cc capacity to a full 658cc. Remaining faithful to the concept of supercharging, the new EN07, SOHC, EFI, air-to-air intercooled mill put out 47kW and 84Nm at 6400 and 4400 rpm respectively. This little tuffy sported AWD and weighed around 730kg. Rex got bitten, though, when the Subaru Vivio replaced it in 1993. 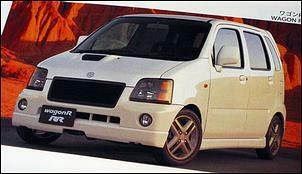 The 730-kilogram Vivio featured much better design and retained the EN07 supercharged engine with the same outputs. A model change in later years saw a boost to 90Nm at 4000 rpm. You may be wondering how fast the little Kei class rockets are. Well, given the 660cc examples are all limited to 47kW and hover around 750 kilograms in mass, they're all pretty well line-ball in straight-line acceleration - expect 9 - 10-second 0 - 100s, with mid-ish 16-second quarter miles. With minimal weight to haul around, even relatively small power-ups can give these cars a sizeable increase in performance. Add a high-flow exhaust, air intake, enhance the intercooling and up the boost and you've got an easy low 15 flier. We've even seen some of these beasts crack into the 13s with standard internals! 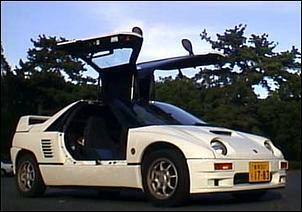 Mazda decided to make an appearance in the Kei performance class with its gull-wing AZ-1 rear-drive sportscar. Using a mid-mounted 657cc F6A Suzuki engine good for 47kW at 6500 and 85Nm at 4000 rpm, the 720-kilogram 'racecar' was a very unusual twist. To this date, they remain rare and extremely collectable. 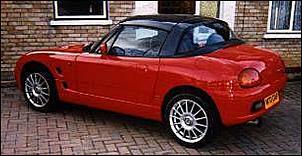 Suzuki - with its open-top Cappuccino - then extended the rear-drive Kei class theme. Using a F6A DOHC turbomotor with exactly the same outputs as the AZ-1, the Cappuccino was a very close rival for the Mazda - they even had identical weight! From 1993, though, the Cuppa then served up a terrific 103Nm at 3500 revs with the move to a new DOHC K6A motor. 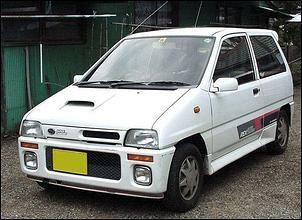 Note that the 1993 Suzuki Alto Works RS/R also benefited from fitment of the new K6A at the same time, making it the undisputed King of Kei hatches. Through the mid '90s, Daihatsu began to broaden its Kei class appeal. The AWD Mira R4 received a JB-JL DOHC, 12-valve, 659cc turbo engine (making 47kW and 100Nm) and that same powerplant also came out in the Daihatsu Move; yep, even a Move can be made to move! The Daihatsu Max and Opti also came out with an EF-DET 649cc, DOHC, 12-valve turbo with 47,000W and an outstanding 107Nm of torque - the highest we've seen from any Kei car. The new Atari wagon and updated Move RS Limited got the same engine to propel its 860-odd kilogram mass. The Daihatsu Terios 'Kid' and Naked wagon (don't ask!) are also endowed with 649cc turbo power. In the late '90s, MMC's Minica started looking a bit strange but it still delivered a good punch; with a newly designed KA30, DOHC, 15-valve intercooled turbo engine making 47kW and 97Nm, it was quite competitive. It appears that the same KA30 turbo engine comes fitted to the intriguing MMC Toppo BJ wagon (seen here), which is based on the Minica chassis. Combating the Daihatsu Move and Atari is Suzuki's Wagon R with its K6A, DOHC, 12-valve turbocharged three that matches the Daihatsu for power, but is slightly shaded with 103Nm of torque. Also in the Suzuki stable is the creatively named Kei, which is based on the Alto; the K6A engine is also available in this vehicle. 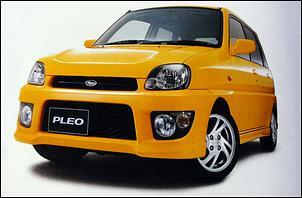 To date, Subaru's supercharged EN07 SOHC motor still lives on in the new Pleo. In its current guise (as at 2002) it is making 47kW at 6400 rpm together with 89Nm at 3600 rpm; its numbers aren't as impressive as the turbocharged opposition, but the EN07's forte is strong low torque and good response. With the huge selection of Kei performance engines and complete cars available for a relative pittance outa Japan, we reckon there's no good reason to overlook them; just imagine the satisfaction of chopping your neighbour's HSV with a souped-up shopping trolley! So go on - either drop a turbo (or supercharged) import engine into a locally delivered small-car or nag your local Japanese importer to bring you a complete car for compliance. Do whatever it takes!